Well, the short answer is "I don't know. I just do it." The long answer takes a lot more time. Sure, I'm busy...but I wouldn't call myself over-scheduled. I refuse to let our family be that way - we've had a few little instances here or there where we got pretty busy (baseball season and 4H are at the same time and that makes for a craaaaazy month) but for the majority of the time I don't let the kids take more than one sport at a time, we try pretty hard not to load ourselves up with activities, we pick and choose what groups we're going to join/participate in, etc. I know that rest and down time are important. 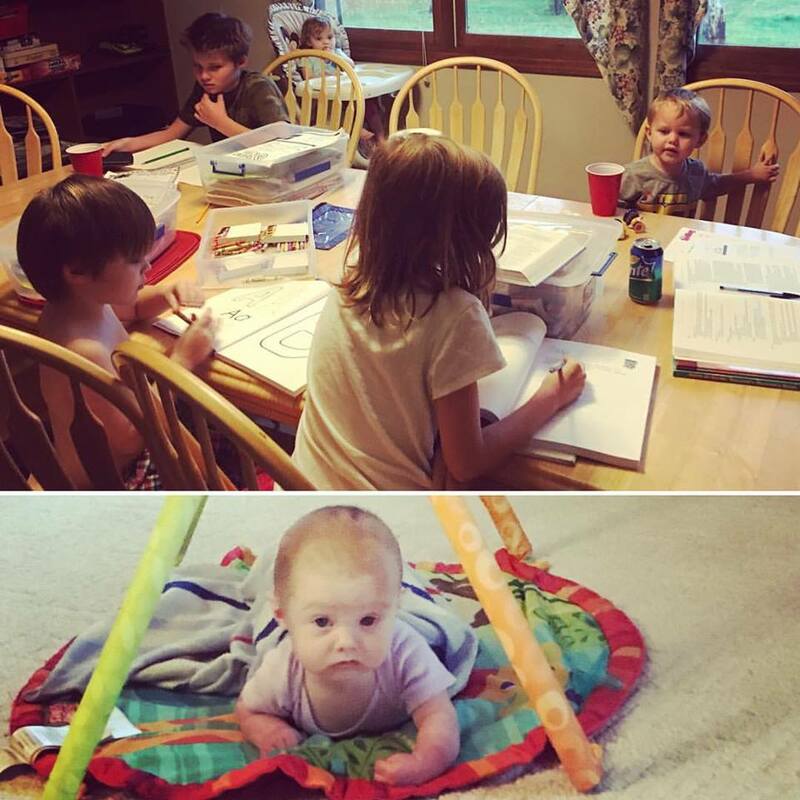 I have a husband and seven kids so life is pretty darn active and noisy most of the time. We recently moved and had a new baby, at practically the same time. We're still trying to finish different house projects here at the new house and get the rest of our stuff moved out of the old house. The kids have activities to go to, my husband works a lot, and we have a few different groups we're involved in. Most of the time my life revolves around making/buying food, diapers, naps, what feels like constant cleaning, breastfeeding, sibling squabbles, constant life lessons for little AND big ones, and sometimes trying to remember who I am. Here recently I've felt guilty every time someone says something about how well I handle things or how they couldn't do what I do. Because honestly? I've just been flying by the seat of my pants and clinging to the edge of this mountain we call life. Even through the stress and squabbles and chaos, life goes on. An infant still needs fed and held. The little ones need naps or they'll get overly crabby. Food has to be made. Chores need to be done and schoolwork needs to be taught. It's interesting having the age ranges we have (16 years old on down to just shy of 4 months) because you've got a mix of different challenges - a kid who is driving, kids who are potty training, a kid who is entering the middle school years, a kid in the heart of elementary school, and tiny babies. So while you're talking about important life lessons with the big ones and making sure they're learning all the things they need to navigate life, the next second you're nursing a baby and then helping a little boy wash his hands after taking him to the bathroom to try and "potty." I also have help from time to time. My mother-in-law is an amazing help - she's always willing to help me with a task or chore, or to babysit so husband & I can have a few moments to ourselves. And those times are so important while you're in the midst of raising kids - it's easy to get busy & forget who you are, as a person or a couple. We're also fortunate to have other family members and friends who will babysit for a bit or drop a kid off at church for an event or even be willing to run an errand for me. And I have older children who are getting more independent. They like to help out (for the most part) and often do things without me even asking. Sure, they have their moments...but what kid doesn't? It's hard to believe, but my children are growing up. I used to think my parents were silly for feeling sad about me growing up. I thought, "What's the big deal? Isn't it a good thing?" But now I get it. I see it and it's equal parts wonderful and horrible. They're growing up and becoming their own individual people, people who have opinions and quirks and problems and relationships. So the long answer summed up is this: I don't "do it all." I'm not perfect. I try my best and sometimes things fall by the wayside. But that's ok. I have people I rely on to help me. We all do what we can with what we have. Anyway, that's enough ramblings for now. I'll update soon with less rambling posts - first up, new baby birth story and then some house news, and homeschooling. Until then!